You know, all respect to teachers and anything, but anyone who actually believed that an elementary school teacher with no medical training somehow invented a medicine that cured the common cold absolutely deserved to be taken advantage of. Not that today's Airborne review has anything to do with that scam, we just like making fun. The oil-rich Navajo parents of Sgt. Airborne indulged their eldest son with skydiving lessons. Also having an interest in the legal system, he studied law and passed the Arizona State Bar exams. He joined the Army and opted for airborne training. Sgt. Airborne jokes around and gets loose, but he's serious too... dead serious. You look at him and sometimes he's looking right through you. It must be the Native American in him. The Navajos call it "the far-seeing look." He graduated at the top of his class from Airborne School, Fort Benning. Qualified expert: Hughes Helicopter Chain Gun, M-16, M-60 and M-1911A auto pistol. Yes, the "Native American" in him. Not needing to be overly PC, the G1 filecard just went ahead and said "Indian" in 1983. After all, all the Joes are native Americans. Well, except for folks like Big Ben, Glenda and the Oktober Guard, obviously. They mostly operated in their home countries, so they didn't even become naturalized Americans. The rest? Natives. Of America. 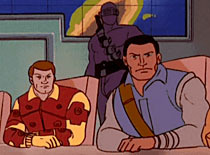 On the cartoon, Airborne's claim to fame was that he had a psychic brother. No, really. It helps to remember that the cartoon was crap. In the comic, he was, like all the rest of the team, really damn competent. And since the book already had enough really damn competent soldiers, he also got to show off in the courtroom, as well. It's not like everybody actually got to utilize their secondary tertiary specialties. Airborne's toy came and went pretty quickly in the early days of the line, so his biggest claim to fame was that parts of his mold were used years later for some iterations of the Steel Brigade mailaway. This particular figure uses Snake-Eyes' chest and upper arms with Gung Ho's legs, but you'd never know it just from looking at him. Yet again, Hasbro's used new add-ons to completely differentiate the new character. For his part, Airborne gets a snazzy blue vest and a brown harness on his legs. The baggy forearms are a new mold, as well. Considering that Spirit was the typical '80s idea of an indian, you can't really be faulted if you didn't realize that Airborne was Native American, too. Take off this version's helmet, and there's no mistaking it. His skintone is decidedly red - almost ridiculously so. Spirit had the cartoony face, Airborne gets the cartoony colors. Unless they're just suggesting that he's gotten a bad sunburn from hanging out in helicopters all the time. It's really red. The sculptural details on the vest are very nice, from the texture of the garment itself to the pockets and the webgear he's wearing over it. There's a non-removable knife and grenade molded on the vest, which is held closed by a single peg on the left side. The harness is brown with a silver D-link on the front, but sadly no rope to run through it. 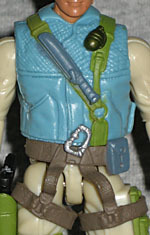 The harness is a separate piece, but don't expect to remove it: the holster and pockets on his legs prevent it from sliding off. 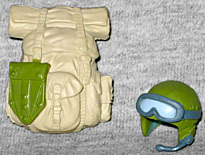 Airborne's helmet - molded with goggles and a microphone - fits on snugly, but getting his backpack peg through both the vest and his back can be tough. Nice details, though, like the wrinkles in the bedroll or the collapsable shovel. Airborne's accessories also include two weapons: a pistol that fits in the holster on his right leg, and an M16 with a bunch of tactical modifications on it. The details on both are fine, but the real standout is the rifle, with its scope, added hand grip and affixed bayonet - actually a Ka-Bar knife, with the blade painted silver. It's really nice gear, all around. Airborne isn't the flashiest figure, but he does look distinct from the rest of the Joes, and is overall fairly exotic. It's not a familiar costume, but it is a faithful update of the original. There was another character codenamed "Airborne" released as part of the Sky Patrol in 1990, but that was an entirely different guy. This is the G1 original, and he's looking great as part of Generation 3.